Sesame benefits in maintaining a healthy body and strong immune system as this herb is rich in various disease-fighting phytonutrients. It is considered to be one of the oldest condiments. The compounds present in sesame seeds help reduce rheumatic pains, prevent high blood pressure, lower blood cholesterol, protect the liver from oxidative damage, etc. Sesame seeds have a nutty flavor. They come in a variety of colors ranging from cream-white to charcoal black. Oil extracted from this herb is known as sesame oil or gingelly oil. Scientific Name: Sesamum indicum L.
Some believe that sesame seeds or Til originated in Africa whereas others claim that this herb is native to the Indian subcontinent. Sesame belongs to the Pedaliaceae family. Sesame or Til has stimulant, anti-inflammatory, emollient, expectorant, laxative, and aphrodisiac properties. Moreover, sesame seeds contain lignan having antioxidant and anti-cancer qualities. For instance, it inhibits colon cancer because it contains phytic acid. Plus, sesame (Til) benefits in lowering cholesterol and has anti-atherosclerosis effects as it is packed with sesamin and sesamo. Sesame lignans help control high blood pressure, too, due to antihypertensive effects. This herb supports bone health. It reduces rheumatic swelling and joint pains. Sesame stimulates circulation and aids in digestion as well. Sesame seeds are also used to get rid of congestion. 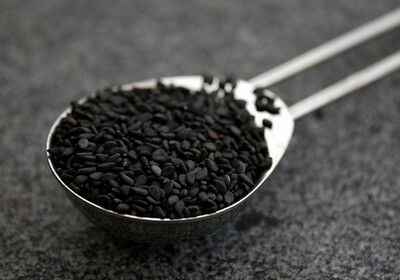 Black sesame seeds can be used in hair recipes to blacken gray hair. They also help in losing weight. Sesame seeds and oil are also considered good for relieving menopausal symptoms. Using a combination of sesame oil, and a pinch of pepper and salt in the nostrils can relieve migraine headache. Massaging the scalp with sesame oil promotes hair growth. Furthermore, this herb is improves liver function. Another benefit of sesame seeds or Til is that they relieve constipation and remove intestinal worms. Sesame/gingelly oil is considered good for skin as it assists in healing chronic skin diseases. It serves as ideal massage oil and reduces the side effects of radiation therapy. Sesame seeds contain omega-3 and omega-6 fatty acids. They are rich in oleic acid, linoleic acid, sesamenol glycoside, calcium, magnesium, manganese, copper, iron, phosphorus, zinc, protein, vitamin B1, vitamin E, etc. Half a cup of sesame seeds have almost thrice the amount of calcium present in half a cup of whole milk. Moreover, this herb is a powerful antioxidant. It is a good source of iron and zinc, especially for vegans. • Having a cup of warm water mixed with a tablespoon of honey and some sesame oil is one of the most popular sesame home remedies for constipation. Follow this procedure in the morning before having breakfast. In addition, consume sesame seeds as a snack. 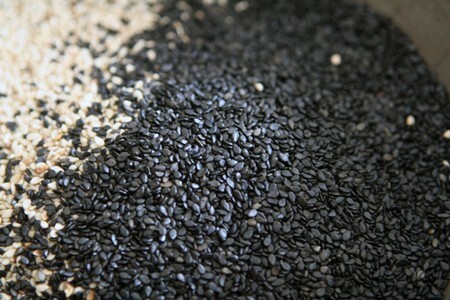 • Boil a handful of sesame seeds (preferably black sesame seeds) in a glass of water. Strain and cool the solution. Drink it about 2-3 times in a day to cure hemorrhoids. Continue this treatment for at least one month. • Relieve intestinal colic in children by rubbing some sesame seed oil on the abdominal area until it gets absorbed. • Application of sesame oil helps prevent diaper rash in children. • Using sesame oil as nose drops can facilitate in the natural treatment of chronic sinusitis. Put one drop of the oil in each nostril and follow this therapy about three times in a day. • Cook a teaspoon of garlic in three tablespoons of sesame oil and rub it on the chest when it is bearably hot in order to relieve chest congestion. • Sesame benefits in treating dandruff and itchy scalp. For this, you need to massage sesame oil on scalp and then rinse it off after 20-30 minutes or leave it in your hair overnight. • Heat two to three teaspoons of powdered pepper in sesame oil until the pepper gets charred. Stain the mixture when it is comfortable warm and use it for massaging on the joins in order to relieve rheumatic pains. Plus, mix ground sesame seeds in your food while eating. However, do not take more than half an ounce of these seeds in a day. • Another natural cure for arthritis is to soak a teaspoon of black sesame seeds in a quarter cup of water overnight and consume this solution (along with the seeds} next day in the morning. • Heat half a clove of garlic in a tablespoon of sesame oil. Cool and strain the solution. Put two to three drops of this therapeutic oil in the ears to get rid of earache. In case there are boils in ears, heat a teaspoon of Bishop’s weed (ajwain) along with garlic in the oil until they turn red. • Simply chewing a handful of sesame seeds is useful healing the problem of receding gums. Besides, you can gargle with sesame seed oil two times in a day to strengthen teeth and gums. In case you do not have the oil then boil 50g sesame seeds in half a liter of water and gargle with this decoction. Here’s a video explaining sesame health benefits, particularly for skin and gums. • When dealing with polyuria, consume a mixture of two tablespoons of jaggery syrup and a tablespoon of sesame seeds. Take a teaspoon of this mixture two times in a day. Follow this treatment for a few days. • Combine equal parts of bottle gourd juice and sesame oil and massage the scalp with this mixture regularly before going to sleep in order to induce sleep and cure insomnia. Besides, you can massage warm sesame oil on the soles of the feet. • Emollient benefits of sesame oil can be derived by applying a home medicine prepared by mixing sixteen parts of crown flower or arka (Calotropis gigantea) and one part each of sesame seed oil and turmeric. This natural remedy cures eczema. • Prepare a paste of crushed Indian lilac (neem) leaves, turmeric and a small amount of sesame seed oil. Apply this paste on the affected area to get rid of ringworm, eczema and other similar skin diseases. • Application of sesame oil on skin helps soothe minor burns. You can also leave the oil on skin overnight to relieve sunburn. • Gentle facial massage with sesame seed oil (preferably mixed with sweet almond oil) nourishes the skin and prevents premature wrinkles. • Grind some sesame seeds and an equal amount of turmeric powder along with a little water to form a paste. Apply this sesame home remedy on your face to heal blemishes. You can also add milk and black cumin seeds in this mixture. • Regularly applying a combination of three drops of sesame oil and a teaspoon of turmeric on skin overnight can acne. • To derive aphrodisiac benefits of sesame consume a mixture of sesame seeds and jaggery. • Having half a teaspoon of black sesame seeds along with lukewarm water is valuable in reducing menstrual problems, especially cramps. • Taking half a teaspoon of sesame seeds mixed with two tablespoons of water two times in a day helps in healing chronic bronchitis. You can also add some honey in it. 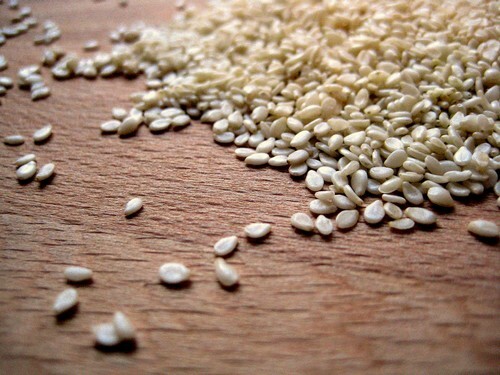 Sesame seeds are used in a number of cuisines. Decorticated sesame seeds are particularly added in bakery items like buns and burgers. 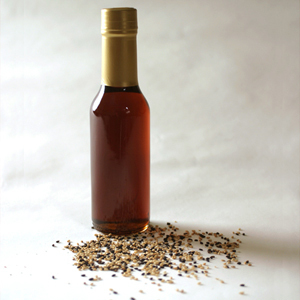 Furthermore, sesame oil is used in cooking and for salad dressings. Sesame allergies are not uncommon. In fact, individuals allergic to peanuts, walnuts, cashew nuts, etc. are more likely to develop food allergy to sesame seeds. Thus, avoid having this herb if you have sesame allergy. Moreover, intake of sesame seed oil may cause diarrhea in some people. All in all, sesame benefits far exceed its side effects as long as you do not take more than half an ounce sesame seeds in a day. I very much enjoyed the information contained in this article on sesame seed and the benefits it has.Thanks very much.